Learn about the In/Out's user interface! 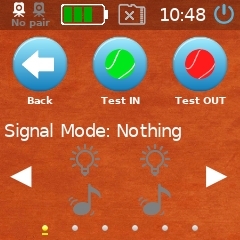 Line Call automatically calls balls in or out. 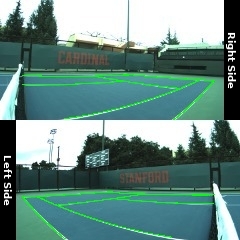 Adjust the angle of the In/Out device so that both sides of the court are in view. Make sure there are no people or balls in the way. 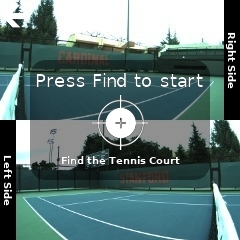 Try to ensure that the space behind the tennis courts are similar on the top and bottom screens. Click on Find Court. 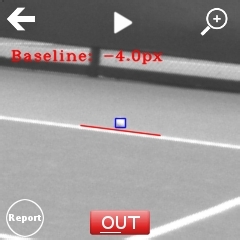 The device will attempt to detect the court lines. If it succeeds, the message "Court found" will appear. You can press outside the overlay to show how the lines have been detected. The lines are colored in green if detected, in red if not. Click on the arrow (Line calling) to proceed. 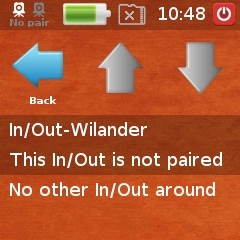 In/Out will now call balls depending on its settings. While in Line Call mode, the screen will show the last ten shots. 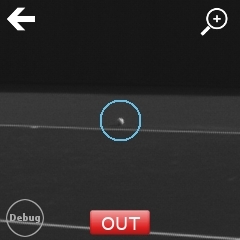 You can use the left and right arrows to select a particular ball and click on the screen to see a replay of where the ball landed. In/Out is still learning, so please report whether the calls are accurate or inaccurate. 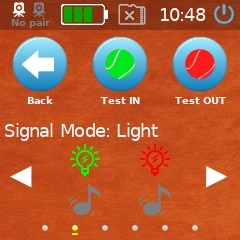 Important Tip: To change how In/Out responds to out balls (with lights and beeps), visit the Settings -> Signal. Tip: To enable recording in line calling mode, visit the Settings -> Advanced and toggle "Line Call" to "Line Call + Rec". Note that it will consume more battery. 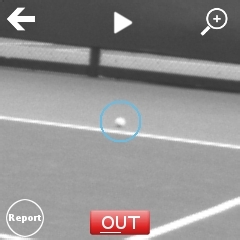 Rec only records your play with both cameras. Press Stop when you are done. To view the videos you have recorded, click on Videos from the Home screen. If you have a microSD card inserted, In/Out will prioitize it over the 4GB internal memory. If you long press on the "Rec only" icon, you can modify the options of video recording. Chose to record one camera or both. 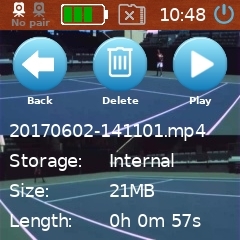 Chose to store or stream video. Chose to record in slow motion (120fps). This feature works only for one camera. You can stream the video in high quality. On the receiving machine (a PC, a Mac, an Android or iOS device), use preferably VLC and connect to this network address rtsp://inout:81. 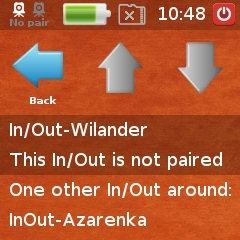 Make sure to be connected to the In/Out Wi-Fi network. The Videos screen allows you to playback previously recorded videos. 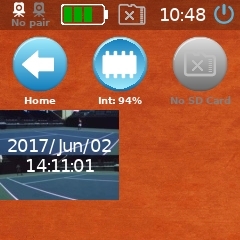 Think it like you want to replay at home your play videos. Tip: The percentage numbers on the two top icons tells you how much storage you have used. The settings section gives access to a lot of settings to tweak your In/Out experience. "Pair Second" allows you to pair a second In/Out device for a more accurate experience (recommended for doubles). "Signal" allows you to change how In/Out responds (with lights, beeps) to in and out calls. 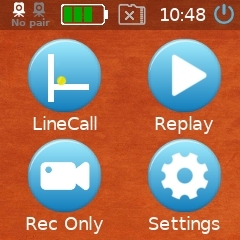 "Line Call" toggles between "Line Call" and "Line Call + Rec". 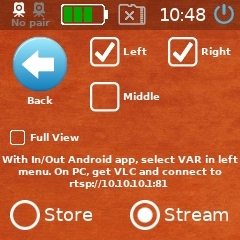 "Rec Options" lets you change the options of the video recording. 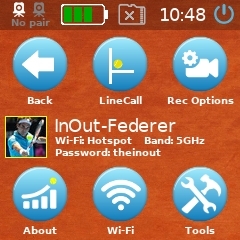 SSID of the Wi-Fi HotSpot of the device is derived from grand slam winners. In this case, this is Roger Federer. Wi-Fi password is theinout in one word, all small caps. 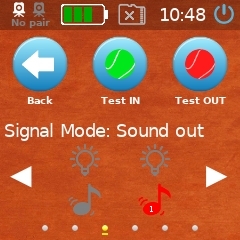 "Sound" allows you to mute and unmute the device. This option doesn't change the in and out beeps. "Setup Device" allows you to setup the device (time, day, imperial/metric unit). "Tools" allows you to access the tools screen. Line Calling manual, auto start, auto start/stop. This is useful for the fixed cage attachment. Manual mode is the standard mode. Auto-start means that the device will automatically goes to line calling mode when it starts unless the left button is pressed. Auto-start/stop does the same and it turns off the device after 10 minutes of inactivity. Note that a long press on the icon is needed to make the change. "Stats" enables to access the summarized stats captured by the device. If any error is detected in the cameras, it's reported here. A warning for the temperature of the processor is reported here. "Wi-Fi" enables to switch between 2.4GHz and 5GHz bands. 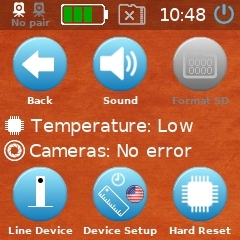 "Format SD" enables to format any inserted micro SD card. "Hard Reset" performs a factory reset. All recorded and stored information is erased. This screen shows the stats, number of line calls and recorded video time, for the current day, the current week (start on Sunday) and forver. Important Tip: A Hard Reset will wipe out all the internal storage, including all the settings at the exception of the SSID of the Wi-Fi HotSpot. 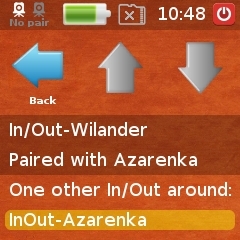 If you have a second In/Out, you can pair them together. You only need to do this procedure once. 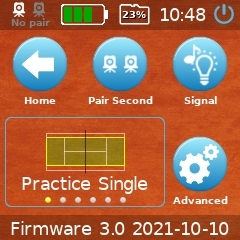 Each device will remember its pair and will reconnect to it automatically when line call is started. Go to the "Pair Second" screen from the Settings screen on both devices. Once you see the other device, press on its name. The paired device is then highlighted in yellow. Exit the menu and go back to the home screen. The devices will be paired automatically and the status icon will be updated accordingly. 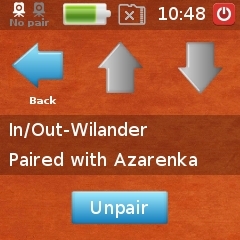 To unpair, go to the "Pair Second" screen on each device NOT AT THE SAME TIME. Press the "Unpair" button and confirm. The setting allows you to adjust how the In/Out device responds to in and out balls. Press the left and right arrows to switch between the six settings, and use "Test IN" and "Test OUT" to see how the device will respond when the ball is in or out. 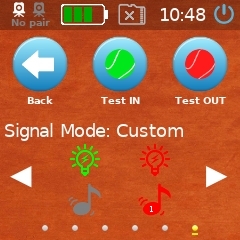 Custom settings enable you to select exactly how the device should signal when a call is made. 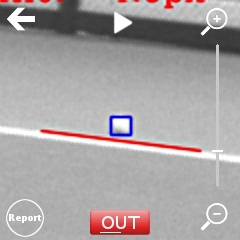 There is a close call option so that call IN are made only when the ball is very close to the line. If you press seven times the Wi-Fi name in the Advanced screen, you can access the Power User screen. This screen is for advanced users and offers a few unofficial tweaks and features that will give you more control on the device and that are usually integrated in the next firmware once they have matured enough. You can enable a filter on noise for the microphone. Set the light settings to automatic, normal or intense. Read the Troublehsooting on-court page for more information. You can read the temperature of the processor in ° Celsius. It's normal if this temperature becomes high (80°C to 100°C) as it measures the internal temperature of the processor - this is not the temperature of the device casing. Close Calls (default: normal): If experimental, the ball is recalculated during close calls for better accuracy of line calling. This is new, therefore experimental. It can lead to more accurate calls but it can also lead to more errors. 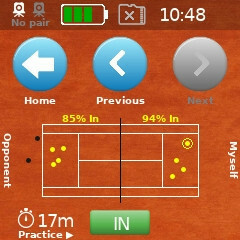 Court Surface (default: normal): if you are playing on clay or hard-thru, try the clay mode. In power user mode, you have access to mutliple "hidden" features. 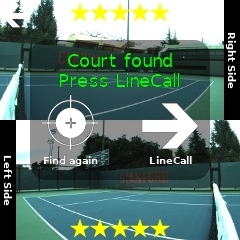 On the preview screen, you can force to report a bad court or you can force line calling by pressing on the sides of the overlay. You can "debug" how a close line call is made. In red you can see the outer edge of the court line. In blue, you have the detected ball. You can swap the players. This impacts only the statistics. This option is not available in training mode. 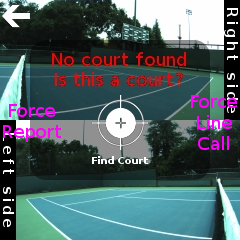 Last, in the line call screen, if you press the very top left corner, you can see the images of the court and how the device is auto-recalibrating itself in case the net has shaken it. A few features can be enabled with a long press touch on the screen. 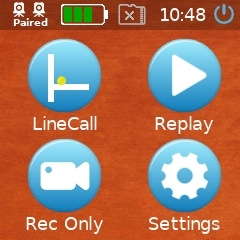 A long press on the “Line Call” icon toggles between “Line Call” and “Line Call + Rec”. A long press on the “Rec Only” icon enables to access the ‘Rec Options screen’. A long press on the green IN / red OUT rectangle enables the auto mode where call review is automatically shown. A long press on the line calling mode gives you access to the 'custom zones' screen. A long on each half court resets the custom zone to 0 (silent). A long press is needed to change the setting of manual vs. auto starts.